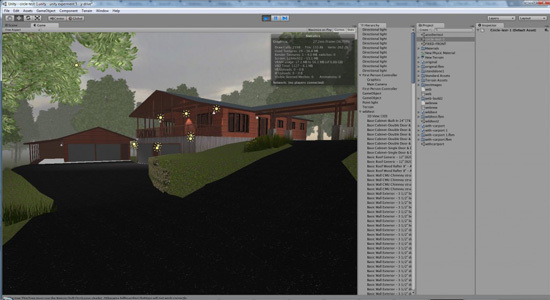 “At Autodesk University, we billed Project Newport as a game engine for architects. Our Discovery Space was constantly buzzing with visitors who wanted to navigate Revit models using game controllers, Wimmotes, or the KOMME®Z table,” writes Scott Sheppard from Autodesk Labs wrote in a recent post. I also found a quote suggesting you can “Watch virtual reality buildings come to life—no headgear required. ” found here. We live in a world where it has become second nature for millions of people to cruise through zettabytes of 3D content using game controllers and 1st person avatars using game consoles and PC games. Yet, visualizing architectural design is still the exclusive domain of prescriptive and expensive 3D animation – generally reserved only for high end commercial projects. The 3D modeler of architectural design is a kind of magician that can transform even the most mundane design into an inspiring and choreographed escapade complete with techno music thumping in the background and cars zipping around the streets. Don’t get me wrong, I get a kick out of those ‘gee-whiz’ architectural animations the same as anyone else. I’ve even employed them in my own practice a time or two. They certainly do have important value. But is that really the way people experience architecture? When will I ever be flying at 200 miles per hour 30 feet off the ground, circling around a building from above before bursting through the entrance and gliding effortlessly through walls – panning around the interior spaces before breaking through the roof and ascending into orbit? That’s simply not how people experience buildings. People don’t fly through buildings, and they don’t bounce and ricochet off of walls like predictable pin-balls – they meander and spiral around at their own pace, taking their time to explore it however they wish. If I can play hide and seek inside of a relatively complex building in Quake or Everquest, why couldn’t that building be a schematic of a new dental clinic my firm is designing? What if the other people exploring the space weren’t trying to vaporize each other with photon cannons but were instead stakeholders in the project – the clients, the builders, the bankers? The emphasis with game worlds is on immersion. That means a big part of a game designer’s job is to make you feel like you are actually inside of that space. Anyone who has spent a few hours tooling around inside of a 1st person game knows how immersed and ‘there’ you can really feel inside of a virtual space. Given the enormous expense and risk of investing in architecture, why can’t clients be given the chance to feel truly immersed and given the chance to tool around inside of their new building before they spend millions of dollars on it? If I could explore the the fortress of Neriak in Everquest 10 years ago, surely by now we have the technological prowess to enable the patrons of architecture to experience the buildings they’ll be forced to live with? This gets even more interesting when programs like Second Life provide the general public an opportunity to build and experience 3D content without a massive up-front expense. Surely the sheer quantity of content created and widespread interest generated during the few short years since Second Life’s genesis says something about the future potential of this technology. It isn’t all about castles and beach cabanas either. One day I asked a new renter on Architecture Island who had imported a floor plan and stretched prims over the walls if she was an architect. She said, “no, but my company is working with an architect to design our new office space, and I want to visualize what it will feel like inside.” Wow. Here you have an architect’s client – unable to visualize a design concept – going so far as to create an avatar, rent some virtual land, learn how to import a floor plan, and how to build… just for the chance to visualize a design concept on her own terms. Imagine what will happen when tools like Second Life enable clients to remove the veil of an architect’s design by modeling it themselves to see what it will *really* be like, and invite their colleagues inside to tour it together in real-time. Or better still, what will happen when the general public decides to rally against a controversial design not by arm-wrestling ineffectively through a planning session but instead inviting citizens into a virtual mock-up in Second Life that better illustrates their case against it? Is the lack of virtual visualization of real life architecture really about waiting for technology to make it possible? Or, is the technology here, but architects just don’t want it? Or could it have more to do with fear of losing control? Obviously, the more an architect reveals about a design, the more there is for the client to evaluate, and the more likely it is the design will be criticized. Its the same reason many architects try to limit the number of 3D drawings they show clients, and stick to 2D plans and elevation drawings. Some architects might even tell you that the client shouldn’t really be concerned with understanding the building beyond what their illustrations convey (after all, you don’t tell a surgeon how you’d like your surgery performed… pfft). It isn’t because they lack the ability or time to produce the 3D drawings, its because they don’t want to risk the exposure and revision requests. But as increasingly sophisticated (and free) 3D tools are made available to the public, a new dynamic could emerge. Before long, clients will be able to simply model their new building on their own with free software (in fact, they already can, and do!). How might that transform the design development and client review process? Plenty of design review boards are now requiring full fledged BIM models for consideration, a technology that is still relatively inaccessible to the public at large. 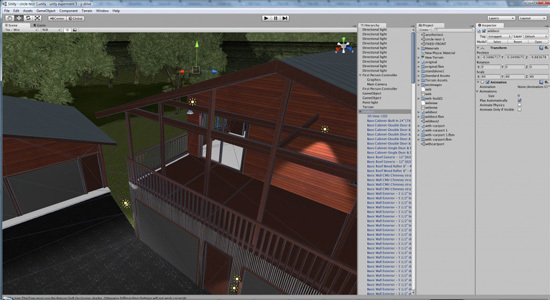 But what happens when someone figures out how to import a BIM into a publicly accessible virtual world? There has certainly been no shortage of discussion and experimentation toward this end, with some promising ideas moving forward. I don’t know much about the technical limitations, but I do know that I was already able to import a parametrically generated model created in professional architecture software into realXtend. What will happen when someone distills a fluid working path between BIM and OpenSim (or Second Life?)? I’m sure the patrons of architecture will be eager to be given a chance to tool around inside of their soon-to-be new buildings, better understanding the entire design from a more holistic perspective, before construction even starts. I wonder how that might transform the design and approval process? It seems inevitable, and will definitely be exciting to witness. So what does this diatribe have to do with Autodesk’s Project Newport? Well, under normal circumstances, I would imagine a product like this taking years to effectively reach the market – with a strong likelihood of never making it to the mainstream. It might draw crowds to a demo booth at AU, but will it ever really be adopted? The general vibe always seems to be that people are still struggling to get from AutoCAD to BIM, and aren’t ready to consider how virtual worlds or game engines might fit into their practice. However, given the momentum, support, awareness and potential cost-effectiveness of bridging architectural software with virtual worlds on a grassroots level, it seems likely that Project Newport could evolve faster than anyone might have anticipated. I certainly hope so! I’ve always wondered which would come first, avatars inside BIM software or BIM software with avatars. Its exciting to see that the race is on!